As the year draws to a close, we reflect on the way that so many dedicated parents have helped spread the word about EC over the last several years. Many families are now practicing it for the second, third, or even fourth time in a row. They're discovering that EC, a wonderful tool for understanding a baby's needs, helps parents to discover the individual personality of each child. Just as each baby is different, each family will experience EC in its own dynamic way. 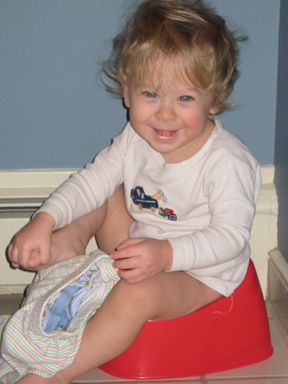 In this issue of Infant Pottying Today, you'll read about the experiences and insights of one mom, Lisa Tunick Boward, who EC'ed all three of her children and found it to be a unique experience with each child. Our regular columns are also geared towards parents who might find themselves raising - and pottying - a baby as well as an older sibling or two. Finally, since we get so many questions about whether the gender of a baby affects EC, Elizabeth Parise, a veteran mom of six, shares her insights on pottying baby boys and baby girls. If you've EC'ed more than one child, we'd love to hear what the experience was like for you. What did you learn about EC, how did it enhance your parenting, and how did your previous experiences with EC help you later on? Please send your thoughts to us at publications@diaperfreebaby.org for possible inclusion in a future article.